Carriage for Prusa Mendel with 25mm and two 40mm fan mounts by novakane is licensed under the Creative Commons - Attribution - Share Alike license. This is an X-Carriage for a Prusa Mendel or compatible printer with 50mm spacing between horizontal smooth rods. 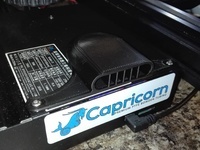 It has mounts for two 40mm fans for print cooling and a 25mm fan with a ducted shroud for cooling a j head. It is loosely derived from my previous x-carriage work for dual extrusion. This is a single extruder j head compatible design which will work with my direct-drive extruder or Greg Frosts geared extruder. As long as the extruder has 50mm M4 bolt spacing with the j head centred, it should be compatible. I printed mine with a 0.5mm nozzle in PLA using 0.3mm layer height and 25% infill. If using ABS or similar plastics that tend to warp, you will probably want brimming for both parts. Definitely print with a brim for the carriage - even with PLA, it is a large sharp-cornered piece which will warp if you do not have good adhesion on the first layer. The shroud should be fine without brimming when using PLA. If there is interest shown, I will modify the carriage to have less sharp corners to fix lifting, but I had no problems printing this as is. Print one belt clamp as provided, and one that is mirrored on the long axis - this will put the tab on the opposite side to fit into the corresponding slot on the carriage.  If you print the "All_Parts.stl" both orientations have been already included. Attach the 40mm fan(s) with two M3 bolts (per side). There is a recess for the nuts which will be blocked by the LM8UU bearings/bushings once installed so this needs to be done first. 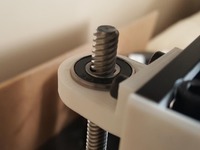 I usually use a bolt with a washer without the fan to pull the nut into the recess, then remove the bolt before attempting to install the fan to avoid damaging the fan - the washer protects the printed part while forcing the nut into place. Fit four small zip ties through the provided slots. If you can attach the LM8UU bearings/bushings separate from the rods you can attach them now with the ties, otherwise leave them in place but open. Put M3 nuts into the carriage where the 25mm fan bolts in. Most extruders will cover these slots. Bolt the extruder down with M4 bolts, there are recesses for the M4 nuts. 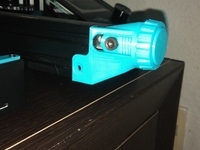 This can be done after attaching the carriage to the printer if it is easier in your setup. The main point is that it should be done before the 25mm fan shroud is attached because it will block access to one of the nuts. Attach the 25mm fan shroud to the bottom of the 25mm fan. You may need to clean up the recesses for the M3 nut a bit with a hobby knife depending on how cleanly your printer made the slots. Attach the 25mm fan to the carriage using M3 bolts screwed into the nuts installed in step 3. Fit the carriage to the printer. If you have 4xLM8UU bearings/bushings already installed to push-fit rods, align them to the carriage then close the zip-ties. If you have removable rods and have already attached the bearings/bushings, slide the carriage on to the rods. 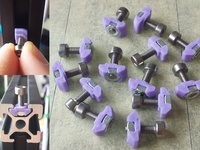 Attach belts using M3 bolts - the clamping system is designed to adequately hold down T5 or GT2 belts. Use M3 bolts through the provided holes to tension the belt.